Torren Martyn, here, is the surfing representative of Need Essentials' all-black, cut-price vibe. 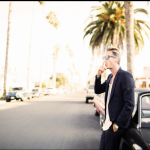 Eight-ball: Need Essentials is the future of surf biz! Earlier today, I posted a podcast with Kelly Slater and mentioned, in passing, that I’d interviewed Maurice Cole for The Surfer’s Journal. In that particular interview, Maurice, who is now sixty three and who was at one time the most in-demand shaper in the world, spoke about the great crisis facing the surf industry. Surfboard sales down fifty per cent, clothes thirty or forty. Jobs lost, workers living in fear, the whole show crippled. And, in that world, he says, it’s the little company, online-only, dynamic, that is going to survive and thrive. Like Maurice’s pal Ryan Scanlon’s wetsuit and accessories brand, Need Essentials. According to Maurice, friends all over the world are getting into ’em. And it ain’t exactly rocket science why. The surf industry, says Maurice, is either going to sink or swim. Kelly Slater as background muzak. Listen: Kelly Slater talks death, raising Chihuahuas! One and a half hours of Kelly Slater! Two days, two podcasts. I’m starting to feel it. I still believe podcast broadcasters need to cut and shave their interviews a little more, think talkback radio instead of meandering late-night conversation, but as muzak, it works. Today, I cleaned the house, edited a story on the noted shaper Maurice Cole for The Surfer’s Journal and incited a fight between a cavoodle and a baby French bulldog whose big head had got stuck between the pickets of my backyard fence, all while listening to Kelly Slater on Firewire’s podcast, The Wire. In this episode, Kelly, who owns Firewire remember, meanders, but does so in a compelling and likeable manner, on subjects as diverse as death (Kelly recites two good stories about a woman who was found frozen on a doorstep but was brought back to life, another is about a brain-damaged child prodigy golfer) Bill Murray learning to surf at low-tide Padang, his Gamma surfboard, Outerknown, Dane Reynolds, the damn busted foot and so on. Analysis: John crushes Gabriel Medina! Who is the world's most popular surfer? Let's dig in to real numbers! I am usually not a stat nerd but when it comes to the unmeasurable like “popularity” or “likability” I can’t get enough. Maybe its the artificiality of applying the science of numbers to something so fleeting. Maybe its the codification of “in crowd/out crowd.” Maybe its just another tool to make some people feel quantifiably better than other people. I don’t know but whatever it is the boys over at empireave.com crunch the information and give me what I needs. 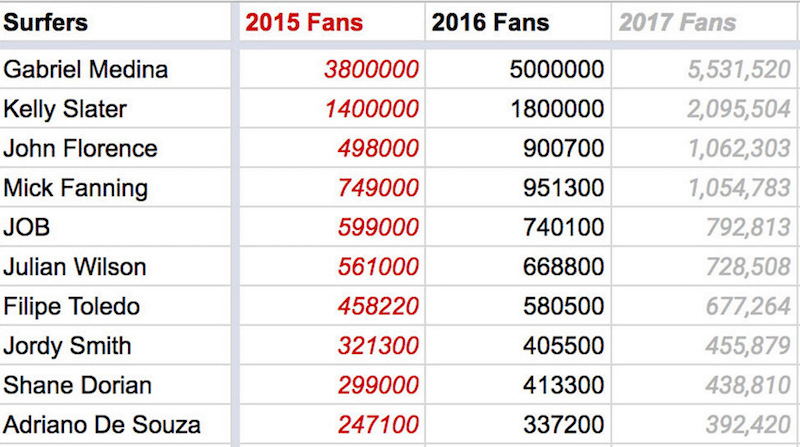 They went and examined the “fans” for the top ten most popular surfers in the world for 2015, 2016 and the first six months of 2017. Any surprises for you? Maybe that Shane Doz cracks the list? Maybe how “popular” Mick Fanning was but how his rate of growth is showing steep decline? Maybe Kelly Slater’s steadiness? Gabriel Medina appears to be king of all surfers. He has as many “fans” as the entire rest of the entire list combined. Are you amongst them? I think probably not and I think you might feel a little sad for the second runner up but best surfer in the entire world John John Florence. Do you feel a little sad for him? If there is one thing social media has taught me since the founding of our little BeachGrit it is that big numbers might make people feel good but the real art is in engagement. How do the people respond to the material you share? And cue the engagement slide! John John Florence has almost twice the engagement as anyone else. Gabs, on the other hand, falls dead last. Scientifically what can we deduce from these hard numbers? 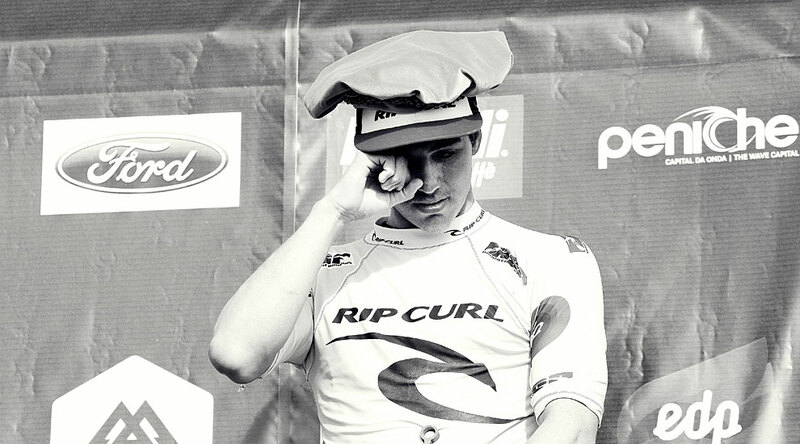 People who like Gabriel Medina tend to be shallow and prone to distraction. People who like John John hang on his every full-bodied turn. Don’t you wish we could actually invest in professional surfers? Kook or Curren is the concept pioneered by Surf Splendour's David Scales where odd-ish behaviour (wearing a rash shirt, booties with trunks) is measured by two poles. 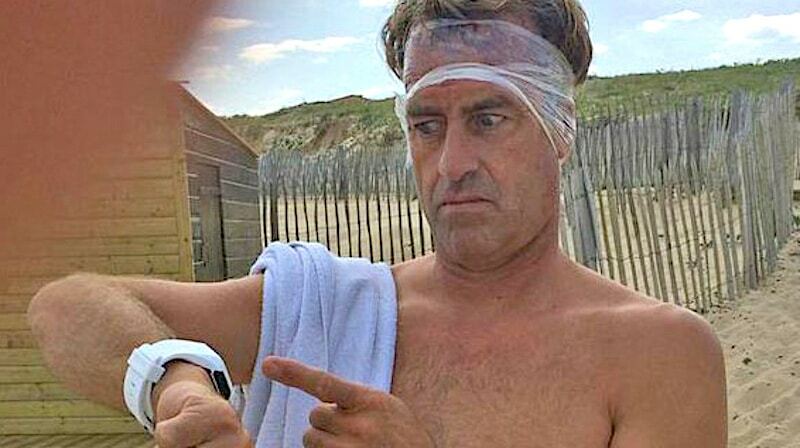 You're either a kook or you're someone fabulous enigmatic, and beyond reproach, like Tom Curren. Are you: A Kook or Tom Curren? Recently, BeachGrit principal BeachGrit Chas Smith and broadcaster David Lee Scales made the fourth of their bi-weekly podcasts. As I may have said before, podcasts are an oddly unabbreviated medium where length seems to trump content, the longer the better. As enthralled I was to Rory Parker’s West Coast baritone, and back when he was a contributing editor to this website, after twenty minutes I was headed for the exits. Where print, and online, demands a ruthless edit, for even one misplaced word will be pounced upon, podcasts seem to be a modern stream-of-consciousness. Unformed thoughts, thinking aloud are native characteristics of the podcast extending thirty minutes of good interview beyond an hour. Oh, but then the commute, the trip to the mountains, down the coast. Kendrick gets you so far. Since falling asleep ain’t the option, I’ve come to live on these things. I’ve thrown David and Chas’ shows on back to back to back and I find that the queer lassitude of Chas is the perfect foil for David’s spring blossom, fierce-about-everything persona. In this episode, which was recorded at Album Surf in San Clemente, California, Matt Parker loans Chas an asymmetrical board and explains he design theory and why it’ll help Chas shred harder than ever. David and Chas then discuss purchasing and reviving the greatest surf brand of all time, whether or not puka shells are ever acceptable, punching your heroes in the face, naming your chid Barrel (yes, someone did), and a Power Rankings of B-list pro surfer’s wives. The highlight, of course, is Kook or Curren. Boys shop for guns whilst waiting for host. These little gun marts are almost everywhere throughout the country. 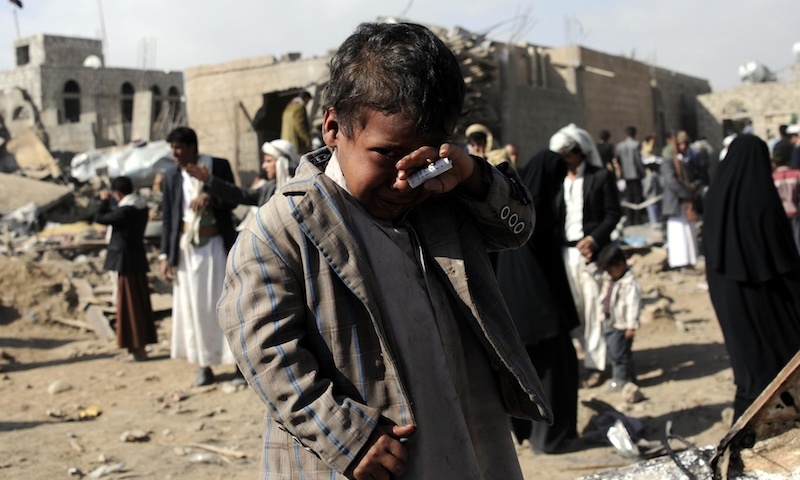 There were more guns, per capita, in Yemen than anywhere else in the world when we were there. A fine statistic. Chapter 4: Boys arrive in the land of knives and dinner jackets. 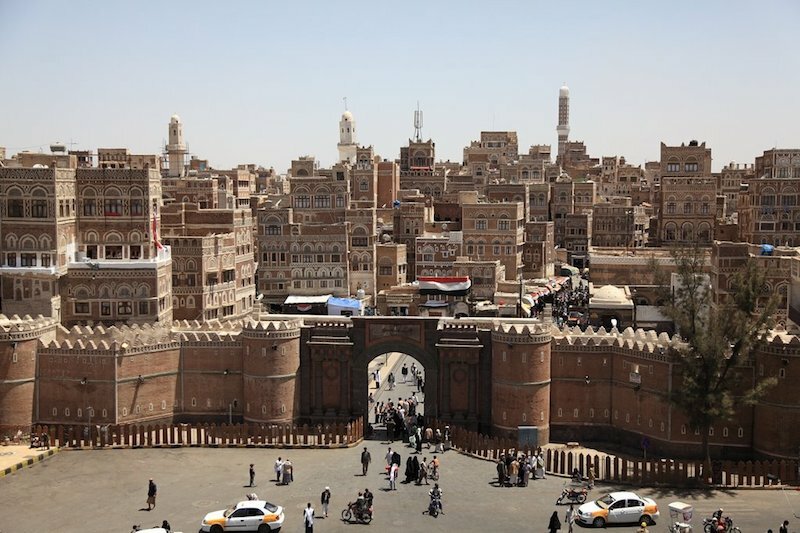 At this moment in history Sana’a, Yemen’s capital, is a prototypical den of human despair. Skeletal children peer through photojournalist lenses. Fathers weep over dead daughters surrounded by dust and rubble. Mothers die of cholera hooked up to saggy IV bags. Saudi bombs, sold to them by the United States, explode hospitals, orphanages, schools. 125 today. 276 dead tomorrow. We, all of us, too busy, too inundated, to care. Last year Venezuela, the year before that Sudan, perpetually Haiti. But as my British Airways flight began to descend from Los Angeles to Sana’a International via London almost 15 years ago I was glued to the window. I had no idea what we would find. Had no idea if there was surf or if we’d be able to get to it. No idea if we actually had visas to enter the country. But it was an adventure and adventure for its own sake is valuable enough. If we succeeded then great. If we failed then we would do so spectacularly. Or at least that’s what I would tell Sam George if Yemen’s security services allowed phone calls from immigration jail. And then we broke through the clouds and the city sprayed before us in its earthen glory. And then the pilot barked something in English about preparing to land and then Arabic. And then the wheels skidded onto the tarmac. J., N. and I gathered our surplus military backbacks and headed out into the… relatively cool? It was to be the first surprise of ten thousand. The expectation when landing in the middle east during the month of June is blazing heat. Cairo in June is unbearable. Dubai in June is a few degrees cooler than the sun. Satan himself vacates Djibouti from June through November. But Sana’a was cool. Pleasant. And I had not taken into account its elevation. The city rests at a comfortable 7000 feet above sea level and boasts summer highs of 78 and lows of 63. I adjusted the collar on my Op Classics button-up, winked at J. though my wrap-around Spy shades and felt ready for whatever fate would bring. I don’t recall any other foreigners on that flight and we shuffled behind the locals toward the single story terminal. Inside men wearing floor length dresses, thick woolen dinner jackets giant belts with even bigger curved knives attached jostled up against the immigration desk. J., N. and I stood off to the side. There was not a woman to be seen. We decided to jostle too even though woefully underdressed. And then we were at the front, pushing our dark blue American passports at a man with a giant wad of tobacco* in his cheek. He stared at them, thumbed their pages, looked back at us with a blank look, thumbed their pages again, looked up and said, “Where’s your visa?” in Arabic. J. muttered that ours were being taken care of by someone important in his formal UCLA Arabic. I probably added something in my laughably broken Egyptian Arabic. The man was not amused. We retreated while he gestured angrily toward his boss and the two of them incredulously flipped though our passports together. We looked at each other and felt the sort of comedic helplessness that strikes any traveler who dares venture outside a packaged tour. Suddenly, a very handsome military man pushed through a door and marched straight up to us. In perfect English he said his name was Khaled, he was there on behalf of H., and apologized for being late. His uniform was immaculate. So was his Don Johnston stubble/moustache combination. Arab military men love the Don Johnston stubble/moustache combination. He strode over to the immigration officers, grabbed our passports, gesticulated wildly then walked back over to us. We told him we did and he pushed us through a side door and into the baggage claim area/entrance hall. I looked back at the immigration officers. One was slightly incredulous. The other seemed indifferent. Khaled stood next to us while our two giant surfboard coffins and cooler filled with film were pushed out. We gathered them, he escorted us to a newer Toyota Landcruiser and had a taxi put our coffins one-third in the trunk, two-thirds hanging into the exotic wilds. And then we were speeding down a wide boulevard with many pictures of the president waving and many military trucks and some donkeys. Khaled explained that H. had been delayed in Dubai for a few days but that he wanted to see us before we left Sana’a and so was taking us to an apartment. I was glued to the window, taking it all in, the gingerbread houses, the men in dresses with dinner jackets and curved knives, the no women, the mosques, the mosques, the mosques. Taking everything in until we screeched to a halt in front of a modest three story building two miles outside the old town. Khaled escorted up to a three room apartment that felt like the lap of luxury to boys that thought $5,000.00 was a fortune. He said he would be seeing us soon and left. And we were in Yemen. *I would learn later that it was not tobacco but qat. An almost perfect drug. 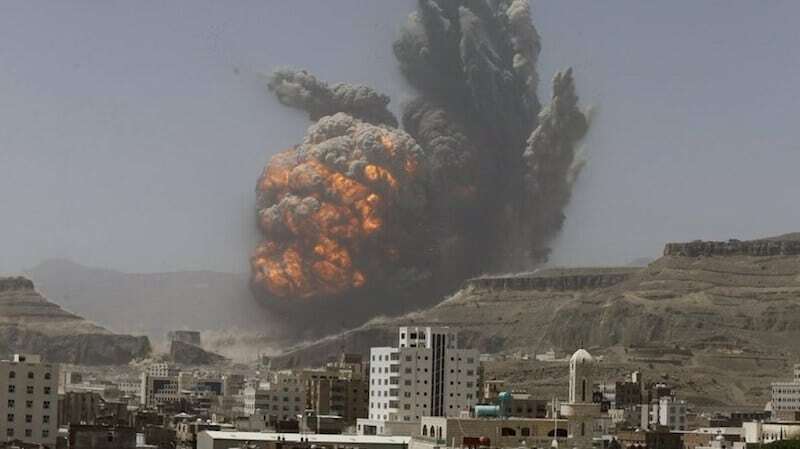 A Saudi bomb explodes in Sana’a. 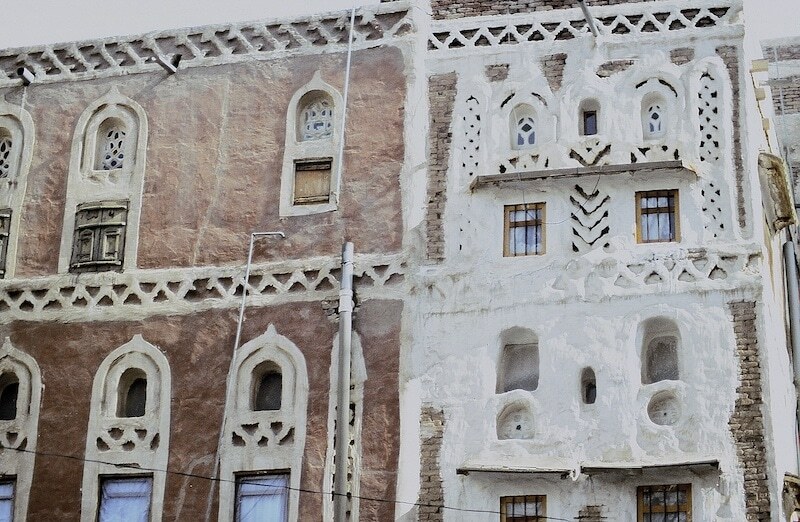 Of all the cities I’ve ever been to in this world, Sana’a is one of the most magical. See the image below for its pre-war glory. It was like a storybook. And it is disappearing, brick by brick, every day.